I don't suppose that there's any reason why holograms have to be created on a flat sheet. It's traditional to do it that way, and it probably makes the optics easier, but there doesn't seem to be an especial reason why all of the sheet has to be at the same angle. If you created a hologram on a curved sheet that surrounded an object, then as long as the sheet kept the same shape, it should presumably look as if the object is inside the volume (rather than appearing to be in front of or behind a flat "window"). There's also no obvious reason why you can't produce cheap printed lenticular holograms on curved sheets either, other than that it'd make the initial processing more difficult. So, Halloween. Once we're set up for manufacturing curved holograms, the obvious application (at this time of year) is the creation of the world's most scary Halloween masks. Put a hologram of a human skull onto a curved transparent sheet, use the sheet as a visor, fitted inside the cowl of a black cloak, and make the inside smoked or semi-mirrored, and you have a "Death" Halloween costume, where, if anyone gets too close and peers under the cowl though the sheet to try to see who's face is behind the visor, they get a rather nasty shock! You don't want people dropping dead of heart attacks when they realise that "the death guy" appears to be wandering about with what seems to be a real, genuine, gaping skull on the top of his neck. I mean, realism is all very well, but to be striding around town leaving a trail of traffic accidents and screaming people and dead bodies in your wake would probably be taking authenticity a bit too far. Oh well. Sometimes it's fun to try to take the most ludicrously-abstract and pointless geometrical results and to try to turn them into something useful. It's a fun game, and the more abstract the thing is, the higher the chance that nobody's actually brainstormed it properly before you. The "square-cutting" exercise ended up as a possible idea for new storage media for hydrogen-powered cars, so after uploading the "Cutting up Doughnuts" post, I was scratching my head to try to think of some real-world application for the "Villarceau Circle" result, that might turn the pastry-cutting exercise into something with actual physics applications. The best I could come up with was a variable-geometry magnetic containment device. 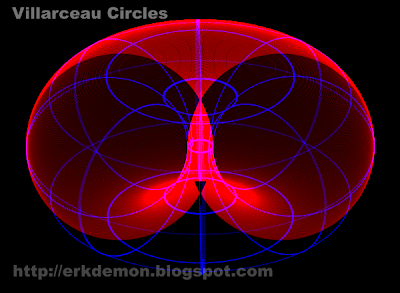 If we take our two interlocking Villarceau circles, and delete one of them, we're left with a simple ring that wraps once around the torus limb and its central void. This counts as a special-case toroidal winding. 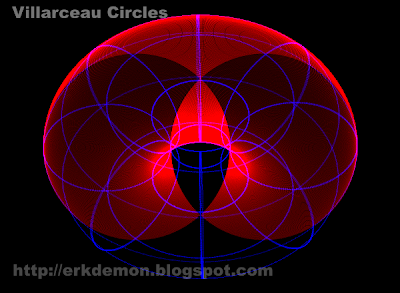 We can interleave a series of these single angled rings around the torus, intersecting, without any of them clashing or colliding. If current is circulated around each ring (perhaps by "breaking" the rings and wiring them in series), you have yourself a rather unusual toroidal coil. What's unusual about it that it has variable geometry. Each circular ring-segment can be a rigid wound coil, and by tilting the angle of these coils we can create a larger torus with arbitrary proportions (major axis radius fixed, minor axis radius variable). Okay, so there's a limit to how fat or thin we'd be able to go due to the finite thickness of the rings that we're using to construct it, but essentially, we have something that looks like a toroidal accelerator and containment device, that can actually change shape while it's running. Provided that the "open" configurations of the resulting toroidal coil aren't too open, this might let you prototype a device without having to calculate the ideal proportions beforehand - you'd be able to adjust the torus shape while the device was actually operating. Now, suppose for the sake of argument that you wanted a containment device that allowed you to open it out, fire high-energy particles into it in low-energy mode, then close the coils, squash the plasma density to encourage some sort of reaction, and then open the coils again to allow the reaction products to spill out into the surrounding coolant. You could have a system that "breathes", and holds different shapes for different parts of its cycle. Okay, I'm trying not to be too glib here – because nuclear physics is NOT my specialist field – but this thing would look awfully like a cross between the "cage fusor devices" and the "tokamak" configurations that people use for nuclear fusion. When it's closed you have something that looks like a tokamak, and when it's open you have something that looks (superficially) more like a fusor cage. 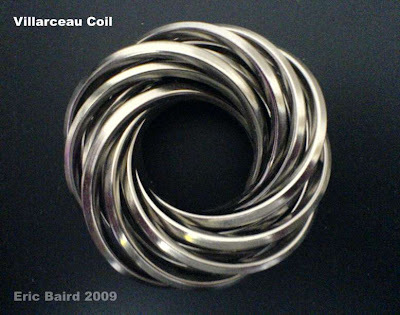 One of the annoyances of the tokamak designs is that once you've built them, they're usually locked into particular configuration – with a Villarceau coil, the variable geometry means that you should be able to get some pretty significant changes in internal volume and field strength without having to vary the current flow to the coils. And if the internal pressure gets too great, the thing's going to have a tendency to self-adjust by opening out like a flower-bud, reducing internal pressure and temperature, and releasing excess plasma into the surrounding coolant in a semi-controlled way (rather than being all bottled up until things go more badly wrong). Anyhow ... bottom line is, that even if this configuration is no damned use at all for conventional nuclear fusion, it'd still look damned cool as a piece of hardware. Designers and art directors for science fiction movies take note. Remember how cool people though the Big Scary Spinny Machine was in Contact (1997)? Well, this configuration would be a really nice thing to use next time you have to design a cool fictional device for a spaceship reactor or engine pod. Shiny silver interlocking steel circles that tilt and swivel, with a whizzy blue plasma glow inside. Mmmm. I want to see this cool thing in a movie NOW ! :) Who's going to be first? PS: I did spent the last couple of weeks seriously consider building one of these as a toy, sticking it in a small vacuum chamber and whacking a high-tension voltage into it, as a version of those plasma balls that you find in gadget shops. I figured that with that, plus a set of circular coil units, and I might have a cool little device that could spin plasma (or bits of shiny silver paper) in an amusing way. I got as far as looking up coil formers. But sanity prevailed. Plus, I think my current landlord might take a dim view of his tenants trying to build small prototype nuclear fusion reactors on the premises. Back in January 2000, the Millennium Dome exhibition opened to what was supposed to be a display of the best of British achievement. Unfortunately the people in charge of setting it up didn't seem to have a clue how to run this sort of exhibition or what to put inside the dome, and it ended up as a bit of a national embarrassment. One of the last-minute additions to the show was the Millennium Star diamond. To see the diamond, you had to walk though an angled passageway that was completely pitch black apart from some slightly odd (monochromatic?) blue light, and there, in the middle, you'd see a case walled with bulletproof glass, containing the blue-lit diamond. You walk past it, perhaps pause, and then make your way out. No loitering, no photography. The human eye is pretty bad at seeing sharp details in blue light, which is why Windows has traditionally had a blue-themed startup screen - the old splash screen used crude dithering to recreate the effect of a smooth variation in tone using the default 16-colour VGA pallette, and by doing this in blue, the eye was fooled into not noticing the effect too much. If Windows 3.1 had tried that trick in red or green or yellow, the result would have been bitty and grainy and would have looked awful. In blue, you can't see the fine detail that gives the trick away. Bulletproof glass uses a "sandwich" of alternating toughened glass and shock-absorbing plastic sheets, so that even if you shatter every layer of glass, the shatter-patterns are different, and the pieces stay stuck together by the plastic. If someone had simply added an additional sheet of plastic film with a with a hologram of a diamond ... then how would you be able to tell? You couldn't look for alignment errors between the sheets on different panes, because the diamond woudl appear at differtent positions when viewed through the different panes anyway, due the the thickness of the glass. Does a holographic diamond appear to refract light in the same way as a real diamond? I don't know, but if someone wanted to look for an "anomalous" spectrum effect that didn't correspond to real diamond, the use of monochromatic blue light might be a good way to stop them. And with single-colour light source, we'd also find it difficult to see any interference fringes due to misregistration of the holographic films. Optical theory says that to see those coloured fringes, the colours already have to be present in the original lightsource, andf in our "blue room", that light wouldn't be there. Of course, for all this to work, de Beers would have to have their own in-house holography R&D department aligned with their security people, which sounds pretty unlikely. But in fact, deBeers do have very strong links to holographic reseach: They have laser systems for checking diamonds, and for laser-etching holographic security marks onto them, and slightly more peripherally, Lucent have been researching diamond as a potential holographic storage medium. DeBeers also have a holographic diamond passport scheme. So diamonds and security and holography research and lasers and de Beers all have a pretty strong overlap. There probably aren't that many companies that know more about certain sorts of holography than de Beers do. ... was never actually there? Cosmological horizons are rather arbitrary. The cosmological limit to direct observation is at different places for different observers, and if you change position, your horizon position changes to match. In that respect, a cosmological horizon is a little bit like a planetary horizon - it's different for everyone, and every physical location can be considered as being at a horizon boundary for someone. With a cosmological horizon, we can mark out a region of space that we reckon should be directly visible, and another region beyond that shouldn't be, and try to draw a dividing line between the two that represents the horizon. The unseen region doesn't exist in an observerspace map even as space, which (in an observerspace projection) seems to fizzle out and come to a stop at the horizon limit. As we try to look at regions further and further away, we're seeing larger and larger cosmological redshifts, and seeing further and further back in time, until we approach a theoretical limit where the redshift is total, time doesn't appear to have moved on at all since the Big Bang, and events apparently frozen into the horizon correspond to those in the vicinity of Time Zero. In an idealised model, trying to see any further away than this means that we'd be expecting to be seeing spacetime events that originated before the Big Bang, which – in our usual models – don't exist. So the cosmological horizon is the rough analogue of a censoring surface surrounding a notional black hole singularity under general relativity. It kinda ties into the cosmic censorship hypothesis that, if any physical singularities do exist anywhere in Nature, Nature will always make physics work nicely and politely helpfully hiding the nasty singularities from view. HOWEVER ... with a cosmological horizon, there are logical arguments that insist that we can receive signals though it. Suppose that we have two star systems, A and B, whose spatial positions are on different sides of our drawn cosmological horizon, a couple of hundred lightyears away from each other. Let's say that B's the closer star to us – 100 ly inside our nominal horizon – and A's 100 ly outside. In an observerspace projection, we'll eventually be able to see the formation of the nearer star B (if we wait a few bazillion years) but A is off-limits. But the nearer star B is quite capable of seeing events generated by A, and then helpfully relaying their information on to us. If A goes supernova, we should (eventually) be able to see a cloud of gas near B being illuminated by the flash. B can pass A's signals on, just as an observer at a planetary horizon can see things beyond our horizon and describe them to us, or hold up a carefully-angled mirror to let us see for ourselves. So technically, Star A, under QM definitions, is a virtual object. It doesn't exist for us according to direct observation, but it's real for nearby observers and we can see the secondary result of those observations. 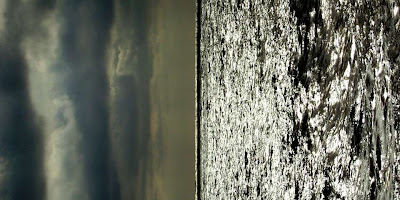 B radiates indirectly through the horizon, so not only does the supposed Big Bang singularity have a masking horizon, the horizon emits Hawking radiation. If we'd bee a bit brighter back in the 1950's, we'd have been able to predict Hawking radiation by taking the "cosmological horizon" case and generalising over to the gravitational case. What stopped us from doing this was an incompatibility with the way that GR1915 was constructed. The cosmological horizon is an acoustic horizon. It fluctuates and jumps about in response to events both in front of it and behind it. If someone near star A lobs a baseball at star B, we'll eventually see that baseball appear, apparently from nowhere, as a Hawking radiation event. And depending on how close the thrower is to the horizon, and how hard they throw the ball, we might even get a glimpse of their shoulder, as the physical acceleration of their arm warps spacetime (accelerative gravitomagnetism, Einstein 1921) making the nominal horizon position jump backwards. For this sort of acoustic horizon to work, the acceleration and velocity of an object has to affect local optics (if the ball had been thrown in the opposite direction, we'd never have seen it). If the local physics at a cosmological horizon generates an acoustic horizon, then that physics is going to correspond to that of an acoustic metric. NOT a static Minkowski metric. The presence, velocity and acceleration of objects must change the local signal-carrying properties of a region. Since the operating characteristics of an acoustic metric are different to those of the Minkowski metric that defines the relationships of special relativity, the local physics then has to operate according to a different set of laws to those of special relativity – the velocity-dependent geometry of an acoustic metric makes the basic equations of motion come out differently. For cosmological horizons to work as we expect, the local light-geometry for a patch of horizon has to be something other than simple SR flat spacetime, and the local physics has to obey a different set of rules to those of special relativity. Now, the punchline: Since our own region of spacetime will in turn lie on the horizon of some distant far-future observer, this means that if we buy into the previous arguments, our own local "baseball physics", here on Earth, shouldn't be that of special relativity either. The good news is that if we eliminate special relativity from GR, to force cosmological horizons to make sense, GR's predictions for gravitational horizons would also change. The revised general theory would predict indirect radiation effects through gravitational horizons, bringing the theory in line with quantum mechanics. Which would be a Good Thing, because we've been trying to solve THAT problem for most of the last 35 years. The bad news is that there doesn't seem to be any polite way to do it. Disassembling and reconstructing general relativity to address its major architectural problems involves going back to basics and starting from scratch, questioning every assumption and decision that was made the first time around, and being pretty ruthless about which parts get to stay on in the final theory. I find this sort of work kinda fun, but apparently I'm in a minority. A cool thing that I didn't know about doughnuts until someone pointed it out a few months back: no matter what proportions a doughnut has, there's always an angle that you can slice though it to produce a perfect pair of interlocking circles. Someone mentioned this on sci.math, and pointed to "Doughnut Slicing", a webpage by John Banks and Jeff Brooks, and then, someone else pointed out that there was already a a Wikipedia article on it, under the name "Villarceau Circles" ... at which point I scooted off and tried to work the thing out from scratch, before reading anyone else's "spoilers". There's only a certain number of cool results like this, and if you read other people's work before you've had a crack at a problem yourself, that's an opportunity that you never get back. Going back and looking at the other two webpages, it seems that, unless I missed it, the authors don't seem to have actually written that down explicitly anywhere (although they do seem to have included some more involved math). So, one quickie download of GFA BASIC 32 (and some quickie trig) later, and the relationship's obviously right. One quick program run while my tea was cooking, generating a few hundred images of tori with radius ratios from zero to one, tilted by the appropriate angles, and I now have a sequence of pretty Villarceau images sitting on my harddrive that I'll probably string together as a YouTube animation at some point. If you want to cut up a doughnut or bagel purchased at your local bakery to see the Villarceau circles, thread a thin stick or skewer all the way through through the central hole, and then tilt it to a maximum so that your pointy-stick is touching two different parts of the surface. That line gives you the plane that you need to cut along, and the two points where your stick touches the doughnut are the two points where the pair of circles intersect. Jonathan Swift (1667-1745) anonymously published his four-part novel, "Gulliver's Travels" in 1726, at the end of a visit to London. Most people know it for the chapters set in Liliput (where Gulliver is a giant compared to the natives), and maybe also Brobdingnag (where the natives are giants, and it's Gulliver who's considered tiny). It's a scathing social and political farce, where Gulliver's visits to other societies show different systems of government and different social orders. While in Liliput, Gulliver is considered a dangerous giant, and treats the tiny locals with callous indifference. In Brobdingnag it's Gulliver who's overlooked and considered unimportant, so the extent that he's caged and treated as a pet. But there's also a chapter (at the end) where he visits the Houyhnhnms, a race of talking horses that Gulliver considers entirely superior to humans, who regard the local ape-decended species (the "Yahoos") as loud, primitive, warlike and violent. After living with the Houyhnhnms, Gulliver comes to see all humans as Yahoos. And for the science fiction fans, there's a chapter about a giant flying saucer. Really, there is. The third section of the story has Gulliver being rescued by a scientifically advanced society, based on the flying island of Laputa. The city is built on a four-and-a-half-mile-wide concave circular plate topped by buildings, along with four lakes for collecting rainwater, surrounding an astronomical observatory built into a central shaft, that also includes the levitating mechanism. It is, quite literally, a "castle in the air" inhabited by scientists. Laputa rules over a kingdom (Balnibari), whose borders are defined by the limits of a naturally-occurring geological magnetic anomaly, and the flying city is held aloft by a giant tiltable magnet, held in place by unbreakable "adamant" cage that is of a single piece with the city's baseplate. The city rises and falls and gets sideways propulsion by adjusting the alignment of the magnet. The flying city is a local scientific superpower, and the king's response to rogue cities below is to steer the saucer above the rebel stronghold and set it down, crushing them. Unfortunately, I'm not aware of any illustrated editions of "Gulliver's Travels" where the illustrators tackled Laputa. Perhaps the idea was just too freaky for them. If they had, they'd have probably ended up drawing something that looked like the mothership in Spielberg's 1977 "Close Encounters" film. The other notable thing about Swift's flying city of Laputa is that although it is ordered along entirely scientific principles, its (highly quotable) math-and-music obsessed inhabitants at the Academy of Lagado are buffoons, working on crazy and expensive projects such as the extraction of sunlight from cucumbers, constantly begging for more money for their projects as the society below them decays – it's a fairly small step to suspect that Swift was taking the mickey out of the esteemed Royal Society (then headed by Isaac Newton), and it's even been claimed that Swift emphasised this by basing all of the Lagado projects on specific Royal Society papers. This raises an intriguing question: did Swift actually meet Newton? It seems that when Swift had been in London in 1710, he'd been visiting a woman called Catherine Barton. Barton was Newton's half-niece, and one of the few people that Newton was close to. Barton wasn't just some peripheral nominal relative of Newton, she'd actually moved to London and moved in with Newton in about 1696 (about the time he got his job at the Mint), and kept house for him. If Catherine Barton was living with Isaac Newton and being visited by Jonathan Swift, then Isaac Newton would have cast a rather large shadow over Swift's consciousness, even if he hadn't been /the/ Isaac Newton. And if that wasn't enough, there was also the subject of Money. Immediately before "Gulliver's Travels", Swift's celebrity was based on his having anonymously written and published the Drapier's Letters in ~1724-25, a series of pamphlets railing against the coining of copper currency for Ireland, which led to a widespread boycott of the new coins in Ireland and their withdrawal. One of Swift's (many) objections was an allegation that the coins were of poor quality - Newton, as Master of the Mint since the mid-1690's, had to get involved and do an assay, and reported that the allegation wasn't true. Newton was known for his tetchiness, but Swift in particular had a reputation for being gratuitously and grossly offensive. I've got an old C19th copy of "Gulliver's Travels" that describes Swift as having "more than any other man who ever wrote in English, a liking for saying nasty things", and blames this for Swift's repeated ruination of his own career prospects. Apparently Swift wanted to be a bishop, but even as a returning hero of the Irish people, when the people in charge actually met him, it became clear that this wasn't going to happen. That edition of "Gulliver's" mentions "the deadly agitations of his private life" as being something that the C19th reader might want to enquire about in later life – but whatever this unmentionable personal train wreck was, it doesn't seem to have made it as far as his Wikipedia page. So perhaps the two wouldn't have wanted to meet each other, especially since they both cared about the same woman. Having the the brittle, acidic, reserved Newton in the same room as the extrovert, scandalous, offensive Swift might not have been a good idea, and the fact that they both had strong ideas about currency would probably just have made things worse. The young, exiled Francois Marie Arouet ("Voltaire") was also in London around this time, and seems to have been rather keen on Catherine, too. Voltaire later went on to write "Micromegas" (1752), a short satire that appears to have been partly inspired by "Gulliver", in which a pair of giant aliens from Sirius and Saturn arrive on Earth and meet up with and ridicule a bunch of tiny Earth philosophers (with the exception of one guy who is a follower of John Locke). That's John Locke, the guy whose writings seem to have influenced the American Declaration of Independence, not John Locke, the character from "Lost" (a TV series about a strange island with a natural magnetic anomaly). Another link between Voltaire's story and Swift's is that both throw in a little casual detail (known to the fictional Laputans and alien scientists) that the Mars was "known" to have two moons, and it seems natural to assume that Voltaire probably borrowed this detail from Swift. In fact, Mars has got two moons – Phobos and Deimos – but they didn't get discovered for real until 1877. That earned both writers an astronomical "credit": the only two named features on the smaller of the two satellites are a pair of adjacent craters, named "Voltaire" and "Swift". After he'd given up on the brilliant Catherine and snuck back to France, Voltaire shacked up, long-term, with another brilliant woman obsessed with Newton, Émilie du Châtelet, who as well as being a serious respected researcher in her own right, translated, produced and reworked (with her comments) the French edition of Newton's Principia. To the C18th coffee-house intelligentsia, a mix of physicists, philosophers and political theorists, this was a time of revolution and restructuring (not to mention a certain amount of fluidity over people's living arrangements). England had recently undergone a rapid turnover of rulers, flip-flopping from Monarchy to Republic, and back to Monarchy again, then Monarchy chosen by Parliament. Cromwell had kicked out Charles I, Charles II and James II had taken over from Cromwell, and the Glorious Revolution had then given Paliament the right to choose the monarch, which brought in William and Mary, and which they then exercised again in the Act of Settlement to shunt the succession to Anne, who'd then died, too. The Acts of Union in 1707 had then finally united England and Scotland as a single kingdom. In the politics of 1726 England there were various entrenched factions with specific ideas about how the country ought to be run, and by whom, but there was no guarantee that any one particular group would obtain ultimate control. There was a sense that this was where we decided what the future was going to look like. Was it going to be run by royalists or republicans? Theologians or scientists? Committees or street campaigners? "Gulliver's Travels" tapped into an appetite for exploring possibilities, and showing how different systems failed. Voltaire's later story got a charge out of lampooning philosophers because at the time, philosophy was reckoned to matter. These guys were potentially the architects of the new society. "Gulliver" can be seen as parody of how people brought up in different political and philosophical systems can believe that their own way of seeing the world and the correct order of things is right and proper, even when outsiders can see that it's ludicrous, and was, in a real sense, revolutionary. Together with a surrounding body of other philosophical and campaign literature, it helped to set up the context for debate that made the French Revolution and the American War of Independence seem possible to the people who risked their lives to make those things happen. It's not just a kid's story about a shipwrecked guy being tied down with string by little tiny people. Here's what happens if you take three single images of Michael Jackson - one as a kid (probably some time around "Rockin' Robin"), one during his "Thriller" period, and one when he was doing odd stuff on balconies – turn each one into a FaceGen head, and then use the program's ageing and tweening settings to generate a set of intermediate heads. The three original heads are top left, centre, and bottom right. The rest are tweened and age-tweeked extrapolations, courtesy of FaceGen. 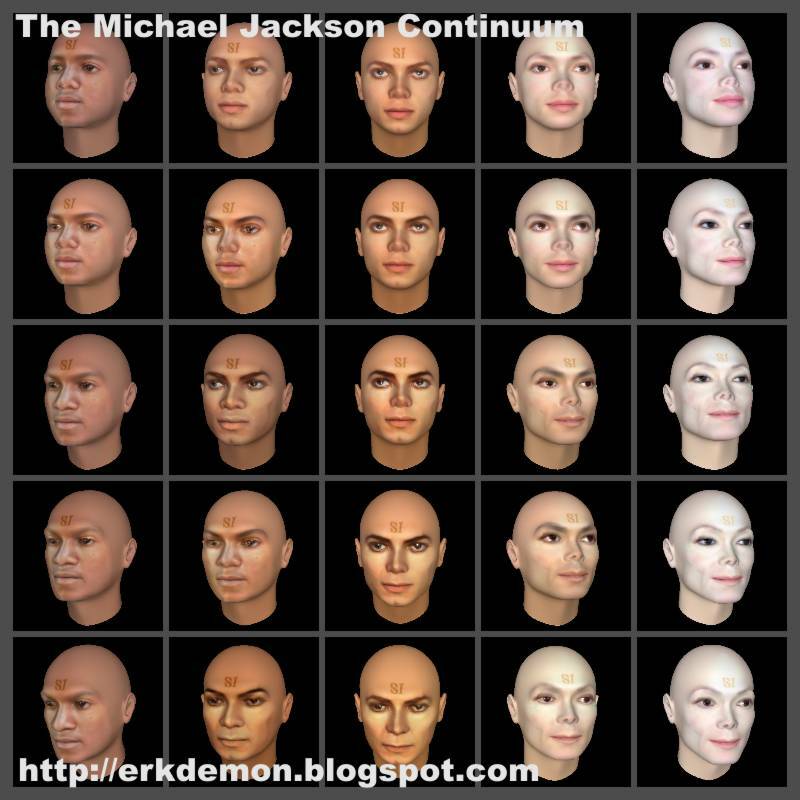 "Bottom left" is what FaceGen extrapolates for Michael Jackson as a fifty-something-yearold with no plastic surgery, top right runs the process in reverse, working backwards from the last picture. The rest are intermediates.